Survox Dialer - Survox Inc. The Survox Dialer provides CATI operation with predictive outbound dialing that, when integrated with the Survox platform, provides enhanced sample management controls to achieve quota objectives faster. Predictive dialing places calls in advance so respondents are available just-in-time for interviewers. Connection attempts are managed by the dialer to ensure that an interviewer is available when a respondent on the line. Monitor interviewers and connection rates for every study, project, or campaign from the Survox Dialer’s console.  You have a choice of how to implement the Survox Dialer. The hardware-free hosted solution provides rapid implementation and expansion with easy access by remote interviewers and call centers. For those who prefer behind the firewall management, there’s an on premise solution. Put Survox’s multi-mode solutions to work for you today. Start now with your FREE quote! Survox provides us with an excellent platform to undertake continuous global phone surveys. Hundreds of interviewers log on to our system from different countries and Survox allows them to perform excellent and high-quality work. … we now have an excellent mixed mode environment for any multi-lingual surveying needs.